The unassuming label of this bottle of hemorrhoid relief pills might not stand out from the rest, but the claim sure does. With promises to treat hemorrhoids at the source with 24-48 hour relief, this product is said to successfully treat both external and internal hemorrhoids by entering your bloodstream. But does Hem Relief deliver on that guarantee? For some, yes. With mixed reviews, it seems only about half of Hem Relief customers experienced relief, and out of those, most experienced only temporary relief. While the product advertises relief of painful symptoms as well as a way to prevent future hemorrhoids, the truth is that customer reviews of these pills did not add up to that pledge. It seemed that the pills were either ineffective at offering relief of their symptoms or the respite was short lived, while several others claimed the relief was instant, but once they quit taking the pills, the pain came back with an intensity they hadn’t previous experienced. While Hem Relief is a natural remedy that contains safe ingredients known to relieve moderate to mild hemorrhoids symptoms, the truth is that several users have reported that the supplement was not so useful in providing permanent relief. There is no indication of how much of some of these ingredients is in each Hem Relief hemorrhoid pill. Witch hazel and horse chestnut leaf, two of the main ingredients, each come with a risk of vomiting and upset stomach. The recommended dosage is 3 capsules, taken 3 times daily until symptoms are gone. For prevention, take 2-3 tablets daily with meals. Anyone with allergies to latex must not take supplements containing horse chestnut without consulting a physician. If you have diabetes, then you must check your blood sugar level regularly when taking this medication. Horse chestnut is known to lower blood sugar levels, and so it must not be taken with certain diabetic medications. 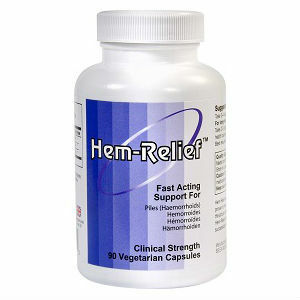 For one bottle of Hem Relief is set at $39.95 which includes 90 vegetarian capsules. These pills can be purchased in larger quantities, which could be a necessity given the large recommended dosage and the fact that for hemorrhoid prevention, they will need to be ingested for the long term. A 90 day money-back guarantee is offered for this product. While outwardly this seems like a great policy, beware the fact that the dosage label clearly states that three pills must be taken three times daily until symptoms of pain, itching, bleeding and swelling are gone, then once these symptoms recede, three capsules should still be taken daily until the hemorrhoids have returned to normal size. Given this time frame, the 90-day guarantee might not be sufficient enough time to tell if the product truly works, meaning you will most likely not get your money back. In addition, the shipping and handling charges are non-refundable. It’s a tossup. Hem Relief seems to work for some, but not for others. While three tablets is the recommended dosage, customers are popping four to six in hopes for any relief. Some consumers are saying that the product only works if taken consistently, and that if the dosage is suspended, the pain returns full force. With this in mind, starting Hem Relief is a lifelong commitment. Unfortunately, this product is not the miracle cure the company claims it is. With the varying side effects of this drug, the risks seem to outweigh the benefits. Which is the lesser of the two evils? Putting up with the discomfort of nausea, upset stomach, vomiting or other symptoms make this product part of the problem instead of the solution. Unfortunately the reviews say it all. Whether the product was used for a few weeks, months, or longer, the consensus is that this product is not the cure all it claims to be. There is no miracle ingredient here. Many who did experience relief seemed to have used it in addition to other hemorrhoid relief products. John Parker	reviewed Hem Relief	on September 3rd	 and gave it a rating of 3.